The Great Food Search: The Best of 2017! 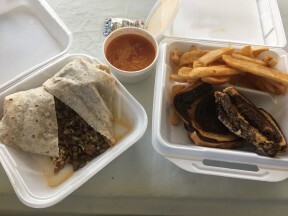 Kings River Life’s The Great Food Search sends me (and sometimes my family and/or friends) eating across the San Joaquin Valley. In 2017, the series featured a baker’s dozen (that’s 13) of eating establishments featuring from tamales to killer burgers, from quesadillas to Tandoori pizzas. It was quite a year, and now I am asked to choose my favorites? Oh, the horror! 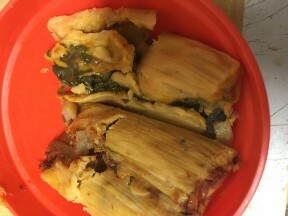 Casa de Tamales in Fresno is home to these tamales, chicken and spinach-artichoke. Liz Sanchez brought the good old-fashioned tamale into the modern age with vegan options alongside the meaty versions…and have you ever had a chocolate tamale? My favorite is Spinach & Artichoke. Liz even weathered the Fulton Street demallinization to re-open the Downtown branch, and still brings her tamale cart to local events. Viva Casa de Tamales! Make your own menu at Chicago’s Pizza With a Twist’s lunch buffet. You don’t have to be Italian to make a pizza, and CPWAT proves it. Sure, you can have a “normal” pizza; they can pile pepperoni and chuck chicken with the best of them. The fun part is mixing the tastes of India with pizza dough: paneer, tandoori. The Three Idiots matches BBQ Chicken, Spicy Chicken, and Garlic Chicken, blending them into a veritable chicken festival. 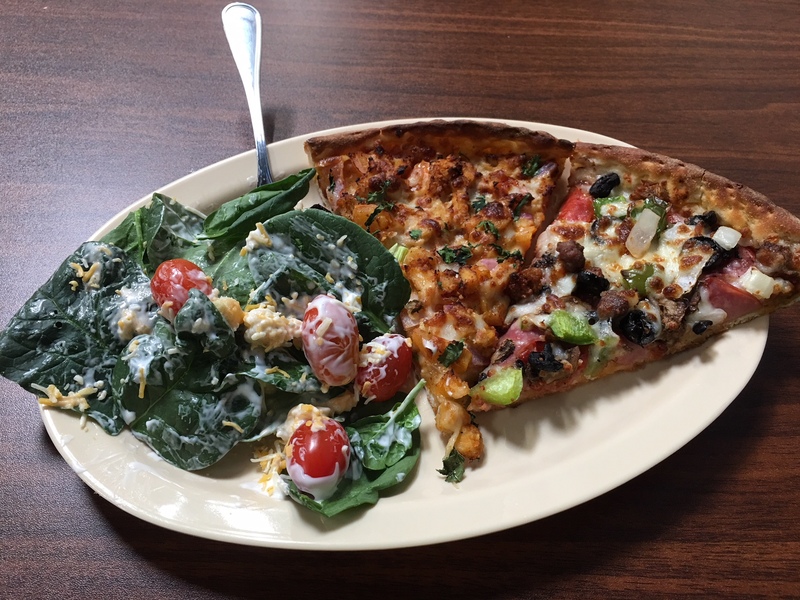 For lunch, get an 8-inch Personal Pizza, or chow down at the Pizza/Salad Bar. It’s not “Kay-sa-dee-ya Go-ree-ya.” It’s “Kay-sa-dill-a Go-rill-a.” Do you want burritos, tacos, or tamales? Go someplace else. 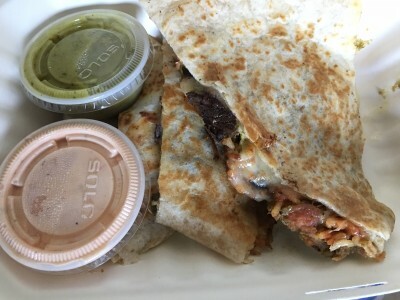 You want quesadillas? 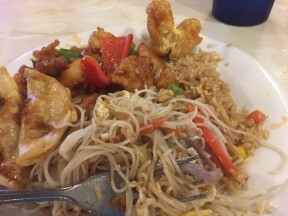 This is the place to go (unless you go to the Visalia branch on Main St., or the one across from Fresno High (next to Ampersand Ice Cream – YUM!)). Choose your own ingredients, or opt for one of their recipes and check the daily specials. It’s an amazing place! 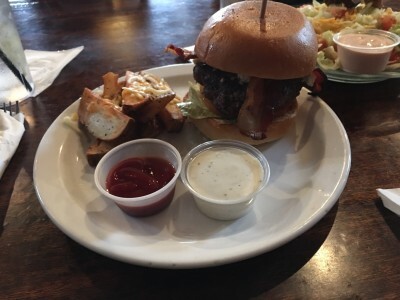 Nestled next to the Manning Avenue Bridge over the Kings River, this place is full of surprises, Their wood-fired grills churns out six-inch-high burgers, sterling steaks, and seriously consider trying the grilled artichoke. There’s something about Reedley and soup. I have had some amazing liquid warmth in the Village across the Kings. Stop at Willie’s for some amazing bowls, but don’t forget the burgers or the fries! An Asada Burrito and a Spicy Patty Melt from Willies Cafe in Reedley. Note: the Tomato Vermicelli Soup is superb! The Bottom Line? These are all places I love, but the food that woke up my taste buds the most was at Wakehouse Woodfire Grill & Barrel. It wasn’t what I expected, but it’s what I liked. If you don’t see what you like on the buffet tables, tell them. It may arrive at your table in a few minutes! The owners want to make people happy, so they have added ice cream to their menu. P. P. S. R. I. P. Scott’s Smokin’ BBQ, Reedley. I hoped being between downtown Reedley and Reedley High School would spell success, but it has gone to that great food court in the sky. Rest in Peace.